Panasonic seems to be primarily thought of as a Raleigh team, but in 1986, they were riding white with blue points Merckxes. The color scheme was a popular one. Another top pro team got the same color scheme, relabled as Caloi, in 1993/1994...that team being Lotto. Speaking of Lotto...those guys rode quite a few different Merckx color schemes. Europ Decor rode in 1984. Prior to that, they rode blue metallic with white panels. Back to Lotto. In 1986, they moved to an all red scheme, and kept it (I think!) through 1987. The only thing that differentiates it from the normal stock frames is that the seat tube has vertical Eddy Merckx lettering, while bikes for us mortals just had the EM logo and the France/Italy world champ bands. Here's a mediocre picture where you can see what I'm talking about. In 1988, they moved to the above, red and white, pointed scheme, as seen here. And in 1989, they moved off Merckx bikes, and on to Vitus. Michel Dernies seems to have ridden on teams Merckx sponsored for all but the earliest years of his career -- starting in 1985 for Lotto, to Domex/Weinmann in 1989-1991, to Motorola through 1995. Being from Belgium, I guess its not that odd, but I thought it was worth noting. It also has nothing to do with team paint schemes. Remember that red and white pointed bike I was talking about before that nonsequitor? Well, it was also ridden by Teve Blad, in 1986 and 1987. I highly recommend looking at the pics of their riders -- they did a photoshoot that makes them all look fairly ridiculous. I have no idea what color frames they rode in 1985, so let me know if you do. Wow, I'm tired! I know I promised Kelme in this post too, but its too much! Panasonic, Lotto, Europ Decor and Teve Blad, combined, rode 5 color schemes. I think Kelme rode at least 3, possibly 4, so they have to wait. I'll get to them in the next post, along with Telekom. first, congratz for your research work, it is impressive. I just bought a Eddy track bike but unfotunatly, it was repainted by the Merckx company 5 years ago for a shop that sold it with all new hubs etc on it to the kid I bought it from. the serial is Z-6654 so apparently, if I undestood right, this bike is from 85.
what I would like to know is how I could find out what was the original painting? also, the fork has no Merckx stemp on it, so I believe they changed it. I could send you pictures. Hope you'll be abble to help me. Your bike is from 1985. Unfortunately, there doesn't seem to be a correlation between serial and paint scheme. No way I can tell you the original paint. It would have been available in just about any color scheme the owner wanted, so as long as its something you like, I wouldn't sweat it. The track fork crowns usually don't have stampings. Later on they might, but the earlier ones never seem to. If you check on the fork, there may be a sticker that has the serial number that matches your frames - this would have been placed there by the factory. Interestingly enough (? ), the Merckx frames that TeVe Blad was riding in 1986 seems to have had external brake routing, while those in 1987 had internal routing. Same/similar paint though. 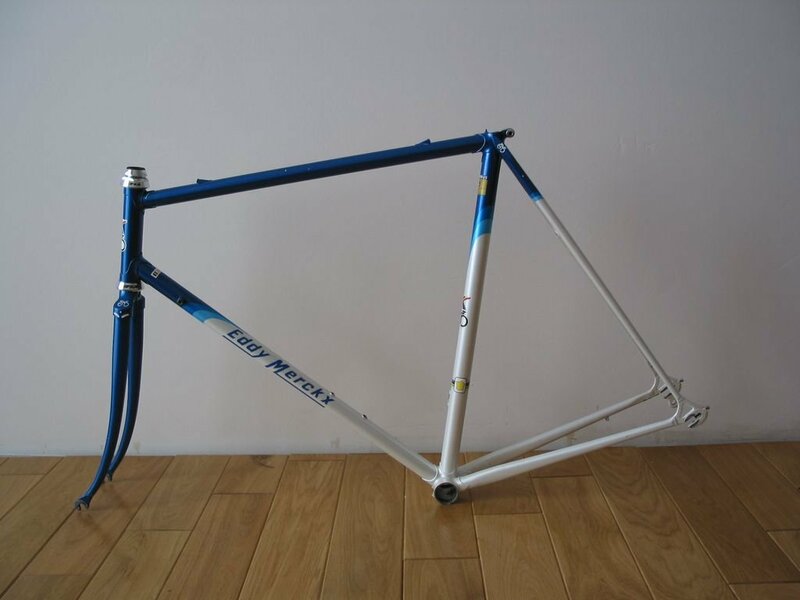 Hi Jermemy, i have an 85 road frame (z-coded) panasonic color scheme and a racing number eyelet. But it does not have a type designation on the left hand bracket side..It also has the old square-ish lettertype.. as i understood team panasonic started in 86. Most pictures i can find are from frames with the more rounded lettertype.. i guess this would be an early version. Frame is made from accaio speciale and does not have a type decal on drive side toptube.. can you help identifying?